Drosera, usually famous as the sundews, encompasses one of the biggest varieties of carnivorous plants, having over 194 species. The members of Droseraceae family attract, arrest, and absorb insects through stalked mucilaginous glands spread over the surface of their leaves. The insects go to enrich the meager mineral nutrition of the soil wherein they grow. You can see a variety of these species, having a large variety of form and size growing natively on all continents but in Antarctica. Most sundews are perennial, though rare varieties are annual. These herbaceous plants form prostrate or straight rosettes with heights varying from 0.4 to 39 inches, depending on the variety. The climbing variety appears in the form of mixed-up stems that can reach the height of ten feet as happens with D. Erythrogyne. You can specify the species under among many forms of growth, including Temperate Sundews, Pygmy sundews, Subtropical sundews, and the Petiolaris complex. 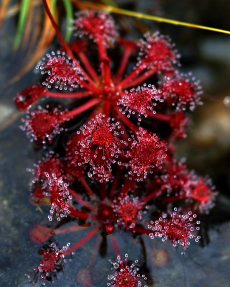 Many types of sundews are self-productive as their flowers often self-pollinate upon closing. In some species, vegetative reproduction crops up naturally producing stolons, and in some other species, the reproduction happens when roots reach closer to the soil surface. Glandular tentacles with sticky secretions covering their laminae, characterize the sundews. The trapping mechanism uses the stalked glands secreting the sweet mucilage that serves the triple function of attracting the insect, ensnaring them and providing the enzymes to aid the digestion process. The sessile glands help to absorb the broken down nutrients. The sweet secretions of the peduncular glands attract small prey that includes insects. Immediately on contact, the sticky mucilage entraps the prey and prevents its progress or escape. Finally, either exhaustion or asphyxiation causes the death of the prey in about 15 minutes as their spiracles clog on the mucilage. The enzymes protease, phosphatase, peroxidase and esterase, secreted by the plant dissolve the insect and liberate the nutrient soup that the leaf surfaces then absorb to help promote the plant growth. 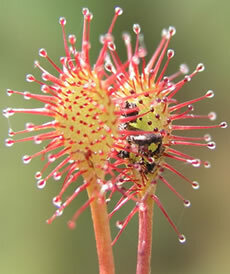 Many herbalists recommend sundew tea for bronchitis, dry coughs, whooping cough, bronchial cramps and asthma. The sheer beauty of their shining traps and the attractiveness of its carnivorous nature have endeared this species to many as ornamental plants. 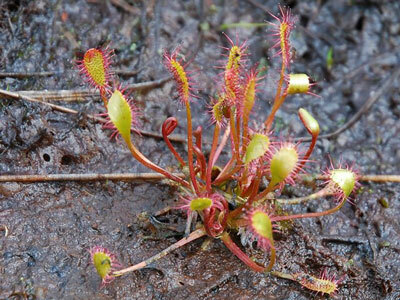 However, growers must bear in mind that cultivating these plants domestically is a Herculean task, as a result of which, obtaining many of these carnivorous plants commercially is a difficult proposition. Long-fibered sphagnum or peat moss mixed with silica sand is the best substrate for this plant, because the higher nitrogen content in potting soil is deadly to them.